In the fall of 2012, the MacAndrews & Forbes Group, LLC and MAFG Art Fund, LLC, two holding companies controlled by business mogul Ronald Perelman sued legendary art dealer Larry Gagosian and his Gagosian Gallery over a complex series of transactions involving works by, among others, Cy Twombly and Jeff Koons. Last week, the case ended with a defeat for Perelman—and a reminder to art buyers that courts are increasingly scrutinizing their pre-sale diligence almost as closely at times as the dealer’s alleged wrongdoing. The Perelman Parties’ claims arose out of a May 2010 agreement to pay the Gagosian Gallery $4 million for a not-yet-completed Jeff Koons sculpture called Popeye. Gagosian is the exclusive dealer for new works by Koons (and, according to the plaintiffs, is considered the “go-to” dealer for Koons works generally). The Perelman Parties’ complaint says that Gagosian knew that the Perelman Parties often bought works as investments and that here, they expected to, upon delivery, be able to resell Popeye at a higher price. They further allege that, a few weeks later (unbeknownst to the Perelman Parties), the Gallery entered a separate transaction in which, among other things, the Gallery promised the artist a significant cut of any future sale of Popeye by the Gallery or any of its affiliates for a fixed period of time after its completion. The upshot, according to the Perelman Parties, was that this side deal rendered Gagosian unwilling to get involved in any future deal involving Popeye during that timeframe (since the profit-sharing arrangement with Koons gave the Gallery a severely diminished financial incentive to do so). The Perelman Parties asserted that, because the Gagosian is generally considered the preferred source for Koons works, and sales through other channels bring lower prices, the situation effectively prevented the Perelman Parties from quickly reselling the work at a higher price. Upon learning that they might have to wait a few years before they could flip the work at what they considered its true market value, the Perelman Parties claimed they “sought to mitigate their damages” through a series of transactions that traded Popeye back to Gagosian in exchange for other works. In these exchange deals, the Perelman Parties claimed that Gagosian caused further damage by refusing to accept a trade-in value for Popeye of more than $4.25 million, which they claimed was “well below” its fair market value; by inducing them to purchase in exchange a Cy Twombly painting that they say was artificially overvalued; and by undervaluing other works of art exchanged by the Perelman Parties. 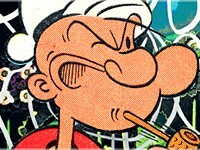 The Perelman Parties also claim that Gagosian delayed delivery of Popeye. They asserted claims for, among other things, breach of contract, breach of the covenant of good faith and fair dealing, breach of fiduciary duty, and fraud. In February, a state trial judge granted Gagosian’s motion to dismiss all Perelman’s claims except the fraud claim. The judge reasoned that there had been no breach of the original sales contract between the Perelman Parties and Gagosian. Although the delivery of Popeye had indeed been delayed, the contract specified only an “estimated” completion date and there was no indication that time was of the essence. Moreover, while the Perelman Parties argued that the contract was breached because the Gagosian’s other agreement effectively created an encumbrance on their ability to resell it, the court was unconvinced; the judge noted that any obligations created by the side agreement were Gagosian’s alone, and while the Perelman Parties might have assumed that they would be able to later flip the work through Gagosian, that was reflected nowhere in the contract. As the trial court neatly summarized, “In essence, plaintiffs’ breach of contract cause of action alleges that, with the benefit of hindsight, it appears to have entered into a bad bargain.” MAFG Art Fund, LLC v. Gagosian, Index No. 653189/2012, 2014 WL 359341 (Sup. Ct. N.Y. Co. Feb. 3, 2014). As to the breach of the implied covenant of good faith and fair dealing, which is inherent in any New York contract, the court held that nothing in the original sale could be construed to create any expectation that Gagosian would be involved in future sales of Popeye, and the covenant does not operate to add to a contract substantive provisions that were not included by the parties. The court also rejected the claim for breach of the covenant of good faith and fair dealing in the exchange transactions, noting that the prices were negotiated by the parties. The breach-of-fiduciary-duty claim is particularly noteworthy because the Perelman Parties placed great emphasis on Perelman’s longstanding relationship with Gagosian. The two were formerly friends and had frequently done business together over the course of two decades, including nearly 200 art deals; they had even collaborated as co-investors in a restaurant in the Hamptons. The Perelman Parties asserted that they had long depended on Gagosian for advice on art transactions, including on the value of works they were considering as investments. They urged that this longstanding relationship, combined with Gagosian’s superior knowledge of the art market, created a fiduciary duty to the Perelman Parties, which Gagosian breached by entering the side deal without the plaintiffs’ knowledge, and by incorrectly valuing the works involved in the later exchange deals. The court held there was no such fiduciary relationship, noting that Gagosian’s superior knowledge of art was insufficient, even combined with a long-standing business relationship with the plaintiffs (or, for that matter, a personal relationship with Perelman, who was not himself a party). In fact, the court emphasized that the Perelman Parties had more than 20 years of experience in the business of making strategic art investments; they were “experienced and sophisticated business investors who entered into negotiated, arm’s-length transactions,” and against this backdrop, their “subjective claim of reliance” on Gagosian’s expertise did not give rise to a fiduciary relationship. The trial court did refuse to dismiss the fraud claim. Here, the Perelman Parties had urged that Gagosian’s fraudulent misrepresentations as to the market value of various works had caused the plaintiffs to overpay for the works they received in the swap deals, while being undercompensated for the works they gave in exchange. The court noted that the Gagosian had submitted documentation undermining these claims (by showing, for example, that on some of the works, the Perelman Parties had actually been credited with a higher trade-in value than was warranted by market prices). But the court upheld the fraud claim because such documentary evidence was not of the type that would normally support dismissal at this early stage of the litigation. The court also noted that it could not say, as a matter of law, that the Perelman Parties’ reliance on Gagosian’s representations about value were unjustified, given Gagosian’s status in the marketplace. On appeal, a five-judge panel affirmed the lower court’s dismissals, and additionally ordered that the fraud claim be dismissed. MAFG Art Fund, LLC v. Gagosian, No. 13685, 2014 WL 6803244, at *1 (1st Dep’t Dec. 4, 2014). The First Department emphasized that the parties negotiated at arm’s length and there were no fiduciary obligations between them, particularly given that the Perelman Parties were corporate entities “who, by their own description, frequently purchased, sold, and exchanged works of art as investments” and were not in any way dominated by Gagosian. On the issue of fraud, the court held that the plaintiffs had failed to adequately allege reasonable reliance, observing that despite their sophistication, the Perelman Parties “conducted no due diligence,” and did not ask to see the market data that went into Gagosian’s valuations of the various pieces at issue in the swaps. The court also held that “statements about the value of art” are “nonactionable opinion” and cannot support a fraud claim. Finally, the appellate court noted that, in entering the side deal with Koons and thereafter refusing to be involved in future resales of Popeye, Gagosian had not breached the covenant of good faith and fair dealing in the original Popeye contract with the Perelman Parties, because “the essence of” that original contract was that the plaintiffs were going to buy a sculpture, not that they would later resell it: “As important as defendants’ involvement in the resale was to plaintiffs, the parties did not include it” in the contract, and the court therefore refused to imply that term into the agreement. This case, like so many covered in this blog, contains important lessons for sophisticated art collectors. The case shines a spotlight on the kind of convoluted “behind-the-scenes” wrangling that happens at the upper echelons of the art market, including situations where a dealer has interests on multiple sides of a deal (as here, where Gagosian had contracts with not only the buyer, but the artist). Moreover, this case shows that courts continue to scrutinize a buyer’s pre-sale diligence, even when dealing with a “superdealer” like Gagosian, who may play a unique role in not only understanding but actually shaping the market for certain artists. Another important takeaway from this case is the holding that while the seller’s statement of fact can give rise to enforceable rights, a statement about a work’s value will generally be considered a non-actionable statement only of the dealer’s opinion. Finally, the Perelman Parties here clearly entered the original contract for Popeye with certain assumptions about what would happen in the near future; indeed, their motivation for entering the deal seems to be that they planned to essentially flip the work within a short timeframe with Gagosian’s help. Yet they did not build those assumptions into the contract (in fact, the Perelman Parties’ complaint, in painting a picture of the parties’ longstanding business relationship, noted that the parties previously had often done “handshake deals” with minimal paperwork). When a party enters into a complex business transaction via a contract that does not adequately reflect the parties’ expectations—no matter how “obvious” the party thinks those expectations are—a court will be reluctant to insert such unwritten understandings into the agreement after the fact. © 2019 Grossman LLP. All Rights Reserved.